Nokian Weatherproof achieved best performance in snow and rain, and lowest noise in the 2015 Auto Zeitung All Season Tyre Test and German TV channel VOX All Season Tyre Test. Nokian WR SUV 2 Winter Tyres also won the German Off Off Road 4x4 magazine tyre test. So far, the world´s northernmost tyre manufacturer, has achieved over 25 test wins so far in winter tyre comparison tests in Central Europe, Nordic countries and in Russia. On snow, “Nokian is the fastest and most stable tyre in the test” is the tester’s evaluation for Nokian Weatherproof. The All-Weather tyre of the world’s leading winter tyre specialist reaches the highest score on slush. 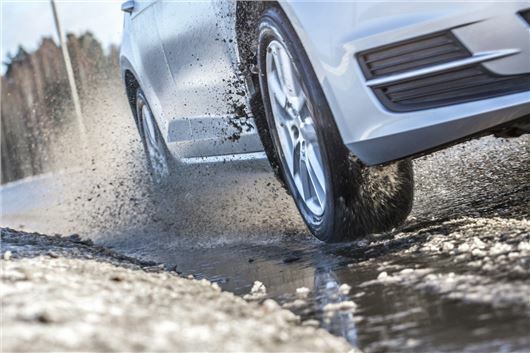 “Highest safety with aquaplaning, short braking distances, good wet grip, safe driving properties” – that is the outstanding rating of Auto Zeitung in its all-season tyre test for Nokian Weatherproof All-Weather tyre in the wet. “Exact steering, reliable driving behaviour – that makes the Nokian fast”. These are the test results achieved on dry surfaces. “Nokian Weatherproof is on snow and in the wet the measure of all things – test winner” is the explanation for the test victory of Nokian Weatherproof in the all-season tyre test. 8 all-season tyres size 185/65 R15 T/H M+S were tested on an Opel Corsa. Auto Zeitung is one of the leading German car magazines and well-known for its profound test reports. Nokian WR SUV 3 is the outstanding test winner in the Off Road winter tyre test and with SUV Magazin. Clear test winner is Nokian WR SUV 3 SUV winter tyre in German Off Road 4x4 magazine winter tyre test 2015 and with German SUV Magazin. Top grade and the judgement “very recommendable” is its convincing result. Nokian WR SUV 3 reaches the highest average grade in the test in every single evaluation criterion: snow, ice, wet and dry. Off Road and SUV Magazin tested 5 SUV winter tyres in size 245/65 R17 on a VW Amarok Canyon. In the winter tyre test 2015 of German car magazine Auto Zeitung Nokian WR D4 is “very recommendable“ and runner-up. A “very strong premiere of the new Nokian WR D4 in all three main evaluation criteria”: On snow, Nokian WR D4 stands out due to its short braking distances and strong traction. Nokian WR D4 drives safely at the limits. In the wet, Nokian convinces with good deceleration and late aquaplaning. The tyre is agile at the limits and its steering behaviour is spontaneous. In the dry tests, it outclasses all other tyres: Auto Zeitung attests highest circle speed in handling, top response and spontaneous steering. Being rated “very recommendable” Nokian WR D4 comes second in the tested tyre size 185/65 R 15. With a “top grade on snow”, Nokian WR D3 is recommendable in the ADAC winter tyre test 2015rated “satisfactory”. Nokian WR D3 is on fourth position of 19 tested winter tyres with good grades also in the categories “dry”, “ice”, “fuel consumption” and “wear”. As multiple test winner, the inventor of the winter tyre, world record holder and innovation leader Nokian Tyres from Finland offers the safest tyres.